152 Dec. 1937. The W.C.T.U. met with Mrs. W. J. Stewart Tue. Dec. 21-1937. Mrs. Stewart conducted the devotional period. The program consisted of poems, stories and incidents relative to the Christmas season. Mrs. Hadley conducted the business session. 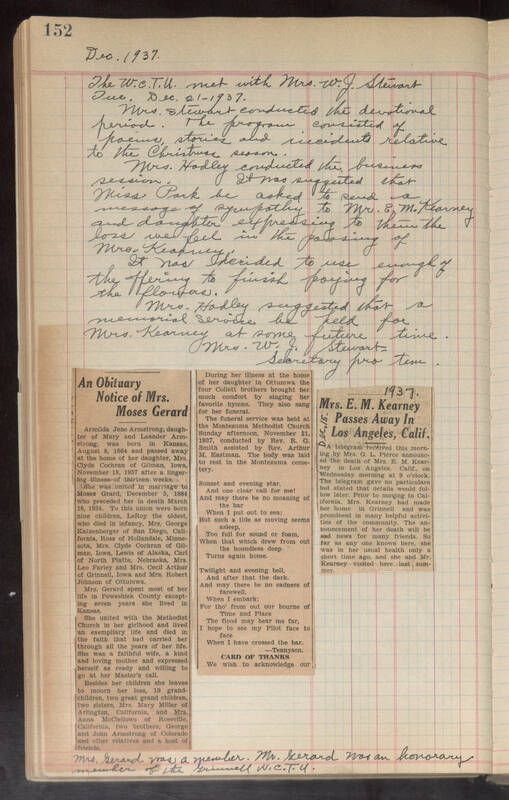 It was suggested that Miss Park be asked to send a message of sympathy to Mr. E. M. Kearney and daughter expressing to them the loss we feel in the passing of Mrs. Kearney. It was decided to use enough of the offering to finish paying for the flowers. Mrs. Hadley suggested that a memorial service be held for Mrs. Kearney at some future time. Mrs. W. J. Stewart Secretary pro tem.